When my husband and I first found out I was pregnant with our daughter, I thought I had motherhood all figured out. I was one of the last of my friends to have kids, and I was pretty opinionated on what I would and would not tolerate in our home. I wanted my daughter to grow up to be a strong and independent woman who wasn’t afraid to fight for what she believes in, but I also wanted her to have a soft side. I wanted her to respect me, but envisioned the 2 of us being lifelong friends who shared everything with one another. I had no intention of yelling at her or enforcing harsh punishments on her, and believed we could talk our way through everything and anything. Ours would be a stress-free household filled with chatter, laughter, and music, and I wouldn’t be a stickler for pushing ‘age appropriate chores’ on my child like my own mother did with me. I truly thought I was going to ROCK parenthood. But then I actually became a mom, and life as I knew it changed forever. Part of my problem is that I grew up in a household where I was expected to do EVERYTHING for myself, and while this has certainly served me well over the course of my life, I was so determined not to inflict the same responsibilities on my own child that I ended up too far on the opposite end of the spectrum. I do absolutely everything for my daughter, and it wasn’t until I had the opportunity to watch her interact with her teachers and peers during school a few weeks ago that I realized how different she behaves when I’m not around to baby her, and in that moment I realized what a disservice I have been doing her by not encouraging her to be more independent at home. So, as much as it pains my younger self, I have been on the hunt for age appropriate chores I can assign to my child to help teach her responsibility and raise her to be the strong and independent gal I know she’s destined to be. When I first started to consider assigning age appropriate chores to my daughter, my initial fear was that it would have a negative impact on our relationship. I envisioned myself nagging and reminding her to complete her responsibilities each day, and that the resulting power struggles would leave the 2 of us frustrated and irritable. This was the experience I had with my own mother, but as I started researching chores charts and the benefits of rewarding kids for helping out around the house, I realized that the issue with my own childhood had nothing to do with being given responsibility, and everything to do with the fact that my mom didn’t choose age appropriate chores for me. As it turns out, assigning your child household chores can actually strengthen your relationship. When you empower your child, give her more accountability, and teach her important life skills, you simultaneously show her that you trust her and that she is a contributing part of the family, which helps boost her self-esteem. Rewarding kids for completing chores can also be extremely motivating, which is never a bad thing! Should you reward your kids for completing their chores? Everyone seems to have their own opinion when it comes to giving their child an allowance. Those in favor argue that tying an allowance to chores provides motivation, teaches financial responsibility, and teaches kids the rewards of working hard. On the flip side, those opposed to paying children an allowance in exchange for household chores make some pretty important points: money doesn’t motivate everyone and paying kids for chores teaches them that housework is an undesirable behavior. Also, since we aren’t paid to clean up after ourselves as adults, some feel strongly that making an allowance contingent on household tasks is misleading. Reward through privileges. If you aren’t keen on providing monetary compensation to your child in exchange for completing household tasks, or feel your child is too young to be receiving an allowance, another option is to allow her to earn additional privileges (i.e. more time on the iPad) by helping out around the house. Provide an allowance, but don’t tie it to the completion of chores. If you like the idea of using an allowance to teach financial responsibility, but don’t want it tied to helping out around the house, it’s okay to separate the two and provide no form of compensation for doing the things you feel your kids are expected to do. Provide an allowance in exchange for completing chores. This is perhaps the most traditional approach, and involves giving your child a set amount of money at the end (or beginning) of each week if her chores have been completed properly and on time. 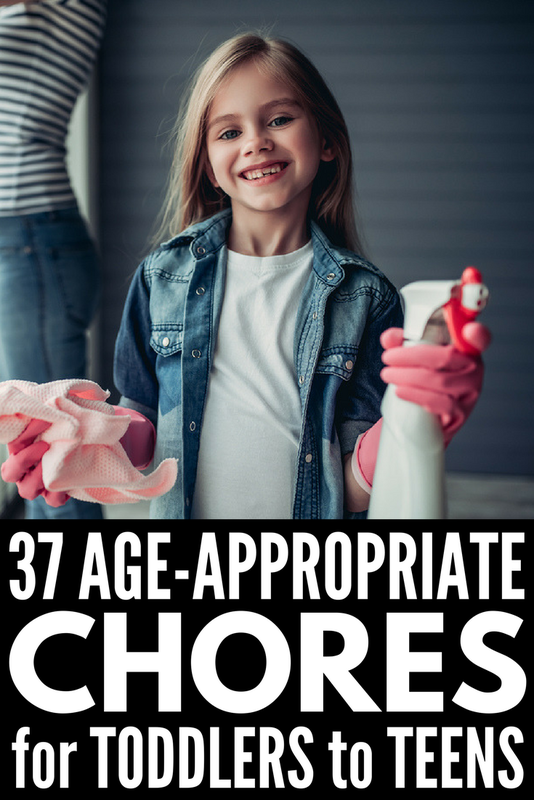 Again, this is a personal preference, but when it comes to determining WHEN to start assigning age appropriate chores to your kids, the consensus seems to be around the age of two. This obviously depends on your child’s abilities, and some children will be able to handle more responsibility than others. The idea is to start slow and to ensure you are choosing chores that are realistic for your child. The more manageable the chore, the more engaged and willing your child will be. There are heaps of great resources online that will help you determine the best age appropriate chores for all age ranges, but what works for one family may not work for another. Make sure you aren’t overwhelming your child, that you keep things fun so your kids don’t lose interest, and that you praise them for a job well done. If you’re looking for chore charts for kids you can download, print, or purchase, here are 11 of my favorites! Perfect for toddlers, visual learners, and children with special needs, this chore chart comes with 76 unique chore cards to visually represent the tasks your child is responsible for. A fun way to keep kids accountable is to equip them with a clipboard and a list of things to do each day, and these free printables are a great way to do just that! Simply laminate them, clip them to a board, and attach a white board marker. BOOM! This is one of my favorite chore charts as it easily attaches to your fridge for easy access and can be completely customized for your children. I love these paint chip chore charts because they break down big jobs into more manageable tasks for young kids, and they are small enough that they won’t take over your entire refrigerator! If you aren’t a fan of hanging up elaborate chore charts around the house, another option is to simply stick a few magnets on the fridge to provide a visual reminder to your kids regarding their daily responsibilities! This is a fun twist on a standard chore chart, and you can get the kids involved in coming up with fun – and realistic – kids chores they can manage on their own. Re-create these adorable morning and evening reward charts with nothing other than a magnetic board, cute magnets, and the printable chore chart Crafting Chicks offers for free! Perfect for toddlers and visual learners, these chore cards are free for download and are so very cute! This is a FUN alternative to a basic chore chart and will keep kids extra motivated to help out around the house! If your child is motivated by monetary rewards, this is a fun way to get her to take on additional responsibility without nagging or reminding! This is a classic chore chart, and we’ve owned one for years. With over 90 magnets to choose from, Melissa and Doug make it fun to create chore charts for your kids, and I love that there’s a white board on the back! Thinking of creating individualized chore charts for each of your children? Here are some great chore ideas (for kids) broken down by age. When done properly, assigning age appropriate chores to your kids can strengthen your relationship with them. By giving your child a sense of empowerment, making her accountable, teaching her important life skills, and confirming she’s a contributing part of the family, you are also telling your child you trust her and giving her self-esteem a healthy boost! Be sure to choose kids chores that not only work for your family, but that also fit your individual child’s abilities, and remember to keep it fun and manageable! If you liked this collection of age appropriate chores for kids, please share this post on Pinterest! And if you’re looking for more parenting tips and tricks, please follow our Parenting board, where we share all kinds of fabulous ideas we find each day!